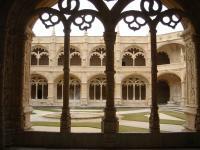 The Monastery of the Hieronymites and Tower of Belem are two early 16th century historical buildings in the port of Lisbon. 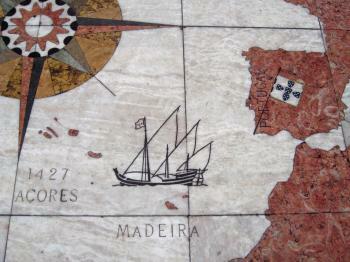 They symbolise the Portuguese Age of Discovery. They were built in the Portuguese Manueline style. The Monastery and adjacent church date from 1501, and were built on orders of King Manuel I. Its church became a house of prayer for seamen leaving or entering port. It later was turned into the burial place for Portuguese royalty. 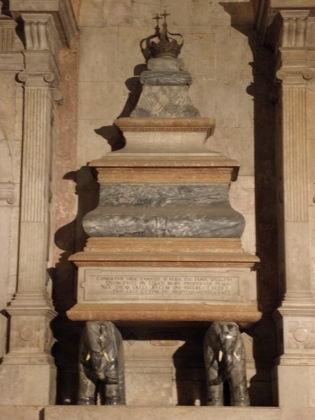 The tombs of the explorers Vasco da Gama and Luís de Camões are also here. The nearby Tower of Belem was built as part of the defense system of Lisbon and ceremonial gateway into its harbour. Late November 2012 I revisited Belem, the neighbourhood of Lisbon that holds Portugal's most iconic set of monuments. I had but a few photos and memories of my first visit, which took place an astonishing 21 years ago! The fact that I am revisiting sites at all means that I am really getting old. The main difference between then and now is that the monuments seem whitewashed (they were very gray on my old photos), and that I now had the time and focus to look for interesting details. Memorable in the church connected to the Monastery is of course the tomb of Vasco da Gama. I also enjoyed the two marble Transept chapels, with the royal tombs resting on elephant's backs. In the monastery is a fine refectory covered with azulejos. Across the road lies the Tower of Belem. I think I did not enter it in 1991, so I made up for it now. I had bought a combination ticket for both sites (10 EUR). It is quite a small building, with not much inside. From the second floor a rhino sculpture is visible, a very exotic addition for a 16th century European building. Read its remarkable story here. Lisbon in general is a bustling city: great food and nightlife. Its history is omnipresent also: it was often from here that the great European navigators sailed out to "discover" the world. My best memories of my trip in 1991 are the fresh seafood, and a night at a Cape Verdian dance club: a new world disclosed itself for me, and I love Cape Verdian - Brasilian - Portuguese music since that moment. Both the monastery and the Tower of Belem were very busy, I assume because many visitors flow into Lisbon off the massive cruise liners. With the Monastery line wrapping along much of the massive building itself, I opted for only seeing the church before making my way to the Tower of Belem. Here I waited in a more tolerable queue. The Tower of Belem has a winding staircase that is now timed to allow visitors up and down the single person stairway. 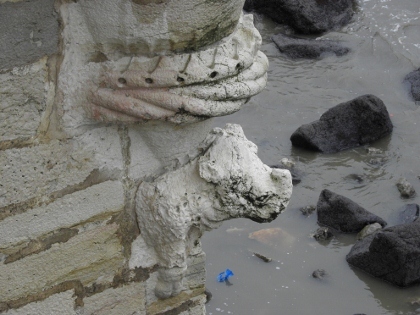 Some of the carvings/designs on walls or decorative sculptures facing the sea stand out, but as previously stated there is not a whole lot on display here. The Church of Santa Maria, part of the Hieronymites Monastery is easy to visit and rewarding. The paintings, royal tombs, and stained glass are exquisite, but hardly singular. We had a pleasant time visiting both places, despite the crowds. Not to be missed is the famous, Pastéis de Belém, which offers some of the best egg tart in Portugal. This pastry shop is a short walk from the monastery. Lisbon is a great city with many attractions, but for me, the clear highlight was the Monastery of Belém, properly called the Mosteiro dos Jerónimos. This huge building is the classic example of the Manueline style that is so widespread in Portugal and features a huge number of fascinating architectural elements of all kinds. It can take quite a while to visit all parts of the complex (and to find your way through the masses of visitors), including the fantastic cloister and courtyard, and the church with its tombs of many Portuguese royals, as well as of Vasco da Gama and the country's national poet Camoes. A part of the complex is occupied by the Portuguese Naval Museum, which has some pretty good exhibitions and is definitely worth a visit (including the very nice cafeteria at the end). 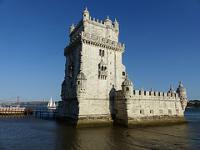 The second part of the WHS, the tower of Belém, is just a short walk away and is probably the most famous landmark of Lisbon. Formerly used as a lighthouse, defensive tower (there used to be a second tower on the opposite shore so that hostile ships could be caught in the crossfire), and prison, it can be reached today via a small wooden walkway and is a nice addition to the monastery as they represent the highlights of Renaissance architecture in Lisbon. The best views of both the monastery and the tower can be enjoyed from the top of the nearby Monument to the Discoveries. Belém is some distance outside the city centre and is quite a long and crowded tram ride away, so the entire visit can easily fill a whole day. As I approached the Tower of Belém, the skies opened up and the rain that had been threatening all morning finally started falling. 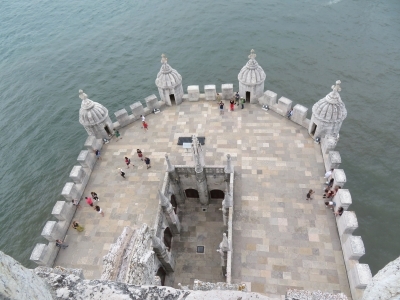 Thankfully there was a lot to see inside both components of this World Heritage Site--the Tower of Belém and the Monastery of the Hieronymites--so I was able to stay dry while learning about Portugal's rich history of exploration. The tower was immediately recognizable to me, since I'd seen it previously on television. It was built as a defensive fortification and a show of power for Lisbon, and I enjoyed the (albeit rain-soaked) views from the roof of the tower. I was not as familiar with the monastery of the Order of Saint Jerome (aka Jerónimos Monastery or Hieronymites Monastery), and I was fascinated to learn that the monks were to pray for navigators and sailors who departed Portuguese shores on voyages of exploration. Within the monastery's church is the tomb of the renowned Portuguese explorer Vasco de Gama. More tributes to Portuguese exploration can also be seen in the buffer zone of the World Heritage Site, which includes the Monument to the Discoveries on the banks of the Tagus River. This monument includes carvings of famed Portuguese explorers, as well as a map commemorating their voyages. Logistics: Belém can be reached by tram or private transportation from downtown Lisbon (an amazing city well worth a visit!). I spent a weekend in Lisbon in March 2015, during which we took the opportunity to visit the suburb of Belém. On the way to the monastery our tram stopped and the driver ordered everybody off, suggesting we wait for a bus to take us the rest of the way. We chose to walk it, and a couple of kilometres later we met the reason for the diverted tram: a military parade going on and a marching band. Portugal’s most famous pastry product is surely the Pastel de nata, which is a kind of custard tart. The best ones are apparently sold in cafes near the monastery, because the monks used to get through so much egg white starching their habits that they became proficient at turning the unwanted yolk into custard tarts. Having had a few pastels de nata in the city centre we were able to discern the increase in quality at the pastelaria 'A Chique de Belem'. You don’t really get to visit much more than the central cloister at this monastery, along with a couple of side rooms. There are two stories, upstairs and downstairs, with walkways surrounding a central grass square. The monastery is notable for the ornateness of the walls and columns, as you can see in the photos. The monastery was started in 1502 by Prince Henry’s grandson, King Manuel I, and took nearly a hundred years to complete. It is after Manuel that the Manueline style in named, and it is synonymous with the Portuguese Age of Discovery. The interior of the Church of Santa Maria, located within the monastery building, is a good example of that style. A fifteen minute walk from the monastery (and across a busy highway) stands the Tower of Belém (Belém is a corruption of the Portuguese word for Bethlehem). The tower was commissioned as a part of Lisbon’s defence system, and is again in the Manueline style. It is built in the water, a couple of metres out from the shoreline, and has been used in anger a number of times over the years. I visited this WHS in August 2014. I spent 4 days in Lisbon and 1 night in Sintra and I would gladly visit both again in a heartbeat. Lisbon is a bustling city with many sites to visit, great nightlife and good food. Transport is no problem so I gladly parked my car for the duration of my stay. The first time I went to the Belem area, I went by tram which was an experience in itself. I bought the combined ticket from the Jeronimos Monastery which meant I could jump the queue in front of the Belem Tower later on. 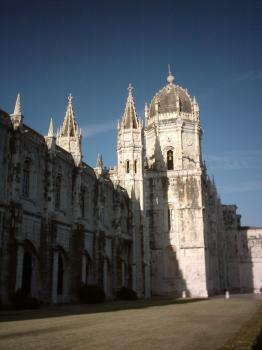 The Jeronimos Monastery is a real gem and the interior has just been cleaned up. The exterior though already needs to be cleaned up and it's no news considering all the pollution produced by the nearby traffic. The highlight of my visit though was the Belem Tower built in the Manueline style. I enjoyed visiting in the morning, at sunset, in the evening, at high tide, at low tide and finally I visited the interior too. It's really a photogenic landmark and a beauty to behold. The most exciting feature of visiting Belem for me is travelling there from Baixa on the old wooden trams that creak and groan their way to the site. I don't know how much longer these trams will be operating as they are gradually being replaced by sleek, modern trams that travel faster and quieter. I don't live in Lisbon, but I know the city like the palm of my hand. Since I was a child, I would go visit it's beutiful streets and palaces. 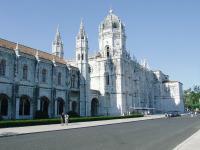 The Monastery and Tower are indeed two of the most fascinating atracions of the portuguese capital. But recomend other places like: the Presidential Museum, the Belem Palace, the Ajuda Palace, the Espirito Santo Foundation Museum, the Glubenkian Museum, the National Museum of Ancient Art, the National Coach Museum, "Sé" - Lisbon's Catedral, Basilica da Estrela, the Roman Theater Museum, the Azulejo National Museum and St. George Castel. 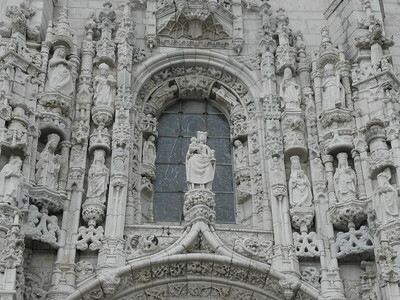 The best sight of Lisbon and the tourist icon of Portugal are comprised to become this world heritage. The best sight is Monastery of the Hieronymite or can be called Monastery of Jerónimos. This monastery is a real gem of Lisbon built in Manueline style or Portuguese baroque with unbelievable details of stone carving. The monastery can be separated into two parts, which open to visitor, the church and the cloister. The church and its great height of the transept is the best example of this uniquely Portuguese architectural style. This place is also the resting place of great discoverer Vasco da Gama which is not surprising at all as this church was really bound with this man and the age of discovery. If you think you see the best part of the monastery, you are wrong. The cloister is even more magnificent with brightly sand stone with fountain and green lawn, truly a magical sight. The cloister also has a museum that tells the history of the church and also the world. The church is free but you have to pay some admission fee for the cloister. The nearby Tower of Belém is also built in Manueline and was used as the fort to protect Lisbon in the center of Tejo River. However, now the fort is near the shoreline as the river stream changes its way. The tower is very nice and become a tourist icon for Portugal, so every tourist has to come to take photo with this place. 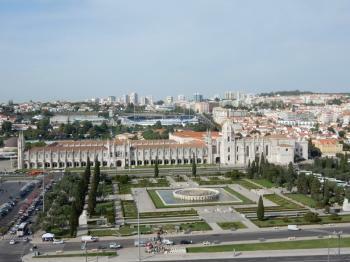 Belém is a very nice area of Lisbon with many beautiful parks, the Discovery Monument and the Presidential Palace. 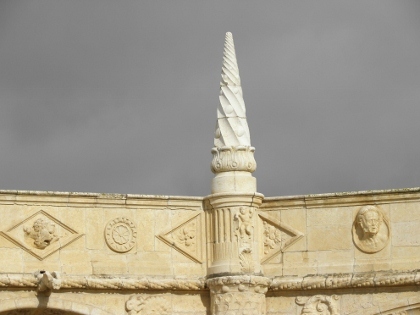 Strolling in Belém is a great contrast with Baixa and gives a new image to Lisbon. As these two places are the must for every tourist with good reason, so if you miss these places I don’t know what to say. And I totally agreed with Ian Cade, Pasteis de Belem is a must. This monastery is jaw-dropping marvelous! And so was the who city of Lisbon! I love the idea of integrating natural forms to gothic architecture to produce this masterpiece of the so-called Manueline style. And best thing, the monument just got cleaned up (restored) when I was there so all its delicate details were flaunted in their full glory! Lisbon was a revelation, I went there expecting a second rate city and left with the feeling that it is one of Europe’s best capitals. Firstly the UNESCO sights in Belem were impressive, the Tower has the a true picture postcard setting, and the Monastery is thoroughly impressive, if you have even the smallest interest in the Age of Discoveries this is a true pilgrimage spot, departing from this spot Vasco d agama and Fernão de Magalhães ‘discovered’ vast chunks of the world. The waterside area also has other attractions such as the discoveries monument and the Ponte 25 de Abril. Also worth a quick try is Pasteis de Belem special custard tarts that are only available in this area (don’t make the mistake like me of saying they just taste like all other custard tarts, desculpe Rita!). As for the rest of the city there is so much to see, the centre is full of squares and boulevards, the Alfama district is the tangled Moorish area that leads to the Castelo Sao Jorge, the perfect place to watch the sun set. Then just head to Baira Alto for some of the best and most densely packed bars in Europe, which also afford great views across the city and river. All in all Lisbon is a confident city that offers some of the best experiences of any European capital. Prince Henry the Navigator: Belem, Jerónimos Monastery - The original Hermitage (Ermida do Restelo), was founded by Henry the Navigator in 1450. 433 Community Members have visited.